It doesn't happen very often around my house, but once in a while the bananas get a bit ripe before they get eaten. Very ripe bananas are perfect for making banana bread, though. In fact, they're the key to making a moist and flavorful banana bread. I stole this recipe from the folks at America's Test Kitchen . It was included in an America's Test Kitchen edition of Let's Get Cooking for the Nintendo DS . (I'll give you a full review of that, later.) I don't know if it's the best banana bread I've ever had, but it does have wonderful banana flavor and wasn't overly sweet, like some banana bread can be. I did modify the directions slighlty, based on my own experience and kitchen. Although America's Test Kitchen won't tell you this, it actually tastes better the second day. 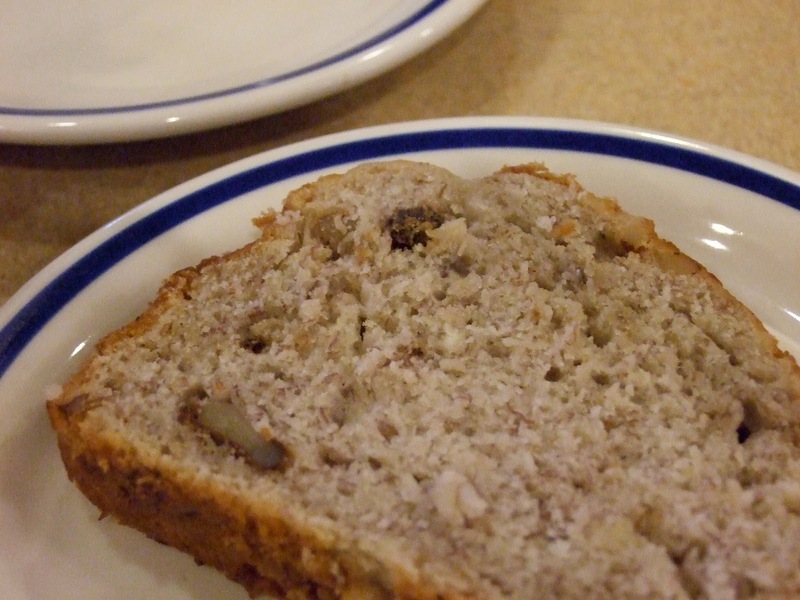 This banana bread recipe uses walnuts, but they're optional. You can substitute pecans if you'd like, or simply do without the nuts. Mash the bananas into paste with a fork. 3 bananas will make about 1 1/2 cups. Melt the butter in a small saucepan. Set aside to cool. Beat the eggs in small bowl; set aside. Toast the walnuts in a dry skillet over medium heat until toasty and fragrant, about 4 minutes. Remove them from the pan and let them cool a bit. Lightly chop. Generously spray the loaf pan with the cooking spray. Whisk the flour, sugar, baking soda and salt together in a large bowl. Whisk the mashed bananas, melted butter, eggs, yoghurt and vanilla together in a separate bowl. Gently fold the banana mixture into the flour mixture until just combined. Fold in the nuts, if using. Do not over mix! The batter should be fairly thick and chunky. Scrape the batter into the prepared loaf pan with the rubber spatula and smooth the top. Bake on the lower middle oven rack for about 50 - 55 minutes, or until a toothpick can be inserted in the center and come out with just a few crumbs attached. Remove from the oven and let cool in the pan for 10 minutes. Remove to a wire cooling rack and let it cool completely before serving, about 1 hour. Note: If you don't have 3 very ripe bananas at the same time, freeze them until you do. Frozen bananas, once thawed, work great for this recipe. Yes, it's my fault the photo is so blurry. Sorry. If you think this one's bad, and it is, you should have seen the other ones. Yeesh. 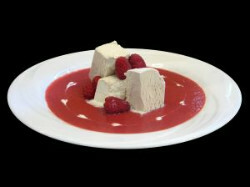 Melba sauce is made from raspberries and current jelly and is a perfect topping for ice cream, fruit, or pound cake. Traditional Melba sauce is cooked raspberries and current jelly. I love that combination, but current jelly is sometimes hard to find and a bit expensive. I wanted something less expensive and quicker to make, so I came up with this no-cook variation. Note: If you choose not to use the current jelly, increase the confectioners' sugar to 1/2 cup and increase the apple juice to 1/4 cup. Puree everything together in a blender. Pass through a fine mesh strainer to remove the seeds, or leave them if you prefer. This is my favorite pizza dough recipe, ever! It's light and tasty, strong enough to hold up to lots of toppings, but with a tender crumb. It's easy to make, too, because it starts life in the bread machine . It does use quite a bit of yeast, so don't be surprised by the ingredients list. It's not a typo. Add the ingredients to your bread maker in the order recommended by the manufacturer. Set the machine to the Dough cycle and let it run. When done, shape the dough into an 18” round pizza pan or pizza stone and let it rest for ten minutes before adding your favorite toppings. You can also use a sheet cake pan, if you don't have a pizza pan. If the dough is too stiff or springy when shaping, let it rest for a few minutes. Preheat the oven to 425 degrees Fahrenheit. Cook the pizza on the middle oven rack for ten minutes, and then check for bubbles. If you see any large bubbles, pop them. Continue cooking for another 5 to 10 minutes until the crust is golden. Makes enough dough for one 18” pizza, or 6 individual pizzas. Those of us watching our weight, and hoping that we aren't just watching it grow, may have a common interruption to our diet plan: stress. Usually, stress comes from work, children, or spouses, but there are other known causes. In any case, I've decided to pull back the curtain and reveal the typical stressed out dieter's daily meal plan. 1 serving of guilt topped with a resolution to do better tomorrow. 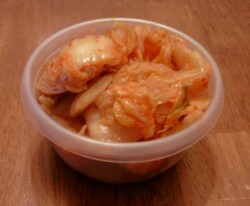 Kimchee is a spicy, pickled cabbage relish. One of my friends refers to it as “Korean sauerkraut.” For years I thought this was totally vegetarian. The recipe I used to make it doesn't have any meat products in it at all. Imagine my surprise when I learned that traditional kimchee has fish sauce, make it unsuitable for a strictly vegetarian diet. I first learned about my culinary faux pas from the incredibly talented Micheal Natkin. His vegetarian food blog, Herbivoracious, is packed with amazing ideas and recipes and I highly recommend giving it a visit. Commenting on a blog post where he uses kimchee, and I revealed my ignorance, he invited me to post my recipe for vegetarian kimchee. Well, Micheal, it's been nearly a year since you asked me, but I'm finely getting around to sharing it. Just to let you know, I stole this recipe from Jeff Smith. His TV show, The Frugal Gourmet , and his many wonderful cookbooks , inspired me to get into the kitchen. I've modified it slightly so that it's easier to make. Remove the limp outer leaves from the cabbage. Quarter the cabbage lengthwise and then cut across each quarter into 1 1/2 inch wide pieces. 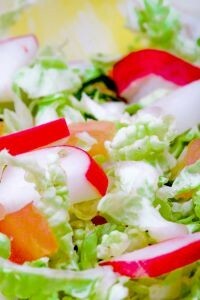 Place the cabbage in a very large mixing bowl and toss with the kosher salt until evenly coated. Cover with a dish towel and let stand for 30 minutes. Toss the salted cabbage 2 or 3 times while it stands. In the meantime, chop, grate and mince the other ingredients. Once the time is up, rinse the cabbage thoroughly with cold water and drain. Toss with the remaining ingredients and pack into a large crock or food safe pottery. Add just enough water to cover the cabbage, about 1 cup. If you can, weight it all down with a plate to keep it well packed. Cover the mixture and allow it to sit on the cupboard or pantry for 2 days. Transfer to glass jars and store in the refrigerator. Makes about 1 quart. Kimchee can be served as a relish with any Korean entree or used in cooking soups or noodle dishes as desired. I like snacking on it with rice crackers and have even used it in peanut butter sandwiches. NOTE: This recipe can easily be doubled or even tripled. I've never tried to hot-pack can my kimchee (it doesn't last that long), but I suspect it could be canned for food storage quite easily. With the discovery of glutamate receptors in the tongue, showing that glutamate is a taste (umami) and not just an “enhancement,” the question of whether MSG is safe to use rears its ugly and confused head. First, let's define what we're talking about. Monosodium glutamate, or MSG, is the free form sodium salt of glutamic acid. Glutamic acid naturally occurs in many fermented or aged foods, including soy sauce, fermented bean paste (miso), and cheese. It's also found in asparagus, tomatoes, corn, peas, and even human milk. Glutamic acid was identified in the year 1866 by Karl Ritthausen, in German chemist. Later, in 1907, Kikunae Ikeda, a researcher at theTokyo Imperial University, identified it in the brown crystals left behind after the evaporation of kombu. These crystals of glutamic acid reproduced a flavor he detected in many foods, especially in seaweed. Professor Ikeda called this flavor umami. He went on to patent a method of mass-producing a crystalline salt of glutamic acid: MSG. MSG and Chinese Restaurant Syndrome. In 1969 this syndrome was attributed to the flavor enhancer glutamate, largely due to the widely-cited article "Monosodium L-glutamate: its pharmacology and role in the Chinese Restaurant Syndrome" (CRS)* published in the journal Science, that year. It became known under the names "Chinese food syndrome" and "monosodium glutamate symptom complex." Symptoms attributed to the Chinese restaurant syndrome are rather common and unspecific. They have included burning sensations, numbness, tingling, feelings of warmth, facial pressure or tightness, chest pain, headache, nausea, rapid heartbeat, bronchospasm in people with asthma,drowsiness, and general weakness. Finding reliable studies on the safety of MSG had been a struggle. As with all things on the net (including this article), lots of people seem to quote lots of other people and then say, “See? This shows I'm right” regarding their position on the safety of MSG. Oddly, people on both sides of the argument quote the same studies as evidence as being for their position, and against the opposing one. The problem with many of the studies that show MSG is the cause of CRS symptoms, an association has never been demonstrated under rigorously controlled conditions, even in studies with people who were convinced that they were sensitive to the compound. A 2002 study, for example, found that rats fed on diets supplemented with 10% and 20% pure monosodium glutamate suffered retinal degeneration, possibly through glutamate accumulation in the eye. The problem is, these amounts are more than 10 times higher than those used for flavoring or naturally found in foods prepared for human consumption. The one constant seems to be MSG sensitivity. Some people are sensitive to it, and others aren't. Those that are sensitive should avoid it. Those that are not sensitive, can enjoy it in moderate amounts. After reading doing the research, and reading the hype on both sides, I've decided to throw my hat in with the MSG is generally safe at normal consumption levels crowd. I've never suffered when eating MSG laden food at Chinese restaurants. It's not just Chinese food, though. You're likely to get as much glutamic acid from eating pizza with tomatoes and Parmesan cheese as you are moo goo gai pan. Does that mean I'm going to rush out and buy a bottle of MSG? No, but not because it isn't safe. I simply don't need to. 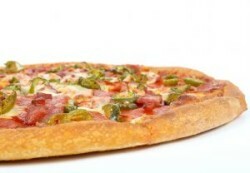 It's already found in ingredients I commonly use to help flavor foods, such as meat stocks and cheeses. I don't add any ingredient to my foods unless there's a reason. If I don't need the MSG to make things taste good, why buy it? *Note that CRS, Chinese Restaurant Syndrom, should not be confused with the other kind of CRS that so many of us face as we get older: Can't Remember .... what was I talking about, again?